BACKGROUND:Postoperative chemotherapy (CMT) or chemoradiotherapy (CRT) is commonly recommended for gastric cancer (GC) patients with stage II and III disease in order to improve survival. 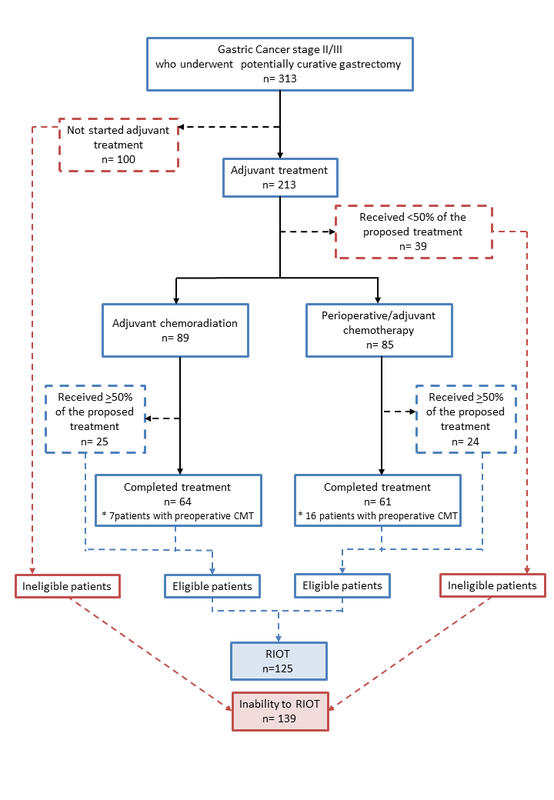 However, some factors that prevent patients from Return to Intended Oncologic Treatment (RIOT) may increase the risk of recurrence and decrease the survival benefits achieved with curative resection. So, RIOT has been proposed as a novel quality indicator in oncology. Thus, the aim of this study was to determine the frequency and factors associated with inability to RIOT. 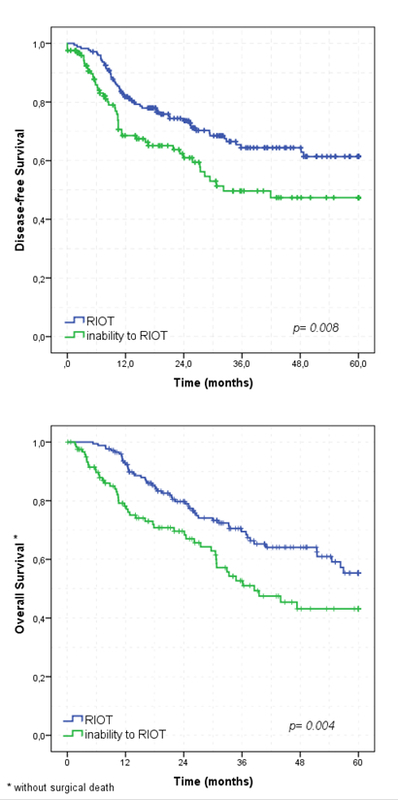 Additionally, we also evaluate the impact of RIOT on patient outcome and survival. METHODS:We retrospectively reviewed all gastric adenocarcinoma patients with stage II/III who underwent potentially curative gastrectomy between 2009 and 2018 from a prospective collected medical database. Based on postoperative medical oncology records, patients were separate into two groups: patients who could return to intended oncologic treatment and received at least 50% of the proposed treatment (RIOT group) and those who could not (inability to RIOT group). The reasons for failure to RIOT were documented, including postoperative complications and adverse events. In survival analyses, 5-year DFS was worse for inability to RIOT than RIOT group (p=0.008), with a median DFS of 32.2 months for inability to RIOT patients. Similar, inability to RIOT had worse 5-year OS than RIOT patients (p=0.004). The median OS for inability to RIOT group was 38.3 months (Figure 2). Absence of neoadjuvant therapy, total gastrectomy, pT3/T4, pN+ and inability to RIOT were independent factors associated to worse DFS. Type of gastrectomy, extent of nodal dissection, pN status, and RIOT group were significantly associated to OS in multivariate analyses. CONCLUSION: Older age, high-NLR and major POC represent independent risk factors for inability to RIOT. RIOT is significantly associated with DFS and OS in multivariate analyses.